The core of the superconducting solenoid magnet at the Large Hadron Collider in Switzerland. Then it will be time to test one of the most bizarre and revolutionary theories in science. I’m not talking about extra dimensions of space-time, dark matter or even black holes that eat the Earth. No, I’m talking about the notion that the troubled collider is being sabotaged by its own future. You might think that the appearance of this theory is further proof that people have had ample time - perhaps too much time - to think about what will come out of the collider, which has been 15 years and $9 billion in the making. He agreed that skepticism would be in order. After all, most big science projects, including the Hubble Space Telescope, have gone through a period of seeming jinxed. At CERN, the beat goes on: Last weekend the French police arrested a particle physicist who works on one of the collider experiments, on suspicion of conspiracy with a North African wing of Al Qaeda. Sure, it’s crazy, and CERN should not and is not about to mortgage its investment to a coin toss. The theory was greeted on some blogs with comparisons to Harry Potter. But craziness has a fine history in a physics that talks routinely about cats being dead and alive at the same time and about anti-gravity puffing out the universe. Dr. Nielsen is well-qualified in this tradition. Dr. Nielsen admits that he and Dr. Ninomiya’s new theory smacks of time travel, a longtime interest, which has become a respectable research subject in recent years. While it is a paradox to go back in time and kill your grandfather, physicists agree there is no paradox if you go back in time and save him from being hit by a bus. In the case of the Higgs and the collider, it is as if something is going back in time to keep the universe from being hit by a bus. Although just why the Higgs would be a catastrophe is not clear. If we knew, presumably, we wouldn’t be trying to make one. We always assume that the past influences the future. But that is not necessarily true in the physics of Newton or Einstein. According to physicists, all you really need to know, mathematically, to describe what happens to an apple or the 100 billion galaxies of the universe over all time are the laws that describe how things change and a statement of where things start. The latter are the so-called boundary conditions - the apple five feet over your head, or the Big Bang. In Kurt Vonnegut’s novel “Sirens of Titan,” all of human history turns out to be reduced to delivering a piece of metal roughly the size and shape of a beer-can opener to an alien marooned on Saturn’s moon so he can repair his spaceship and go home. 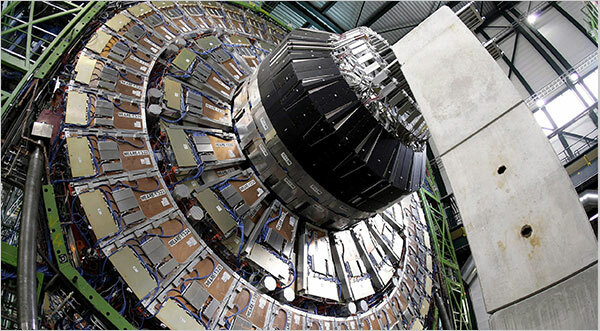 Whether the collider has such a noble or humble fate - or any fate at all - remains to be seen. As a Red Sox fan my entire adult life, I feel I know something about jinxes.